There are many ways to grow. We expect to see children grow in stature and knowledge. But this journey that Josh is on has been so amazing for me to watch. Josh, from birth, has been small for his age. Josh couldn’t do the physical things that other children do so I never gave much thought to the things he couldn’t do. I concentrated on his strengths. We focused on the ‘can do’ things. But his decision to work with a personal trainer has reminded me of something I’d forgotten. Or, if not forgotten, at least ignored. I forgot about ‘will’. I’d be the first person to tell you that visualization is powerful. I don’t understand why. In my mind it’s all jumbled together with faith, and power of the subconscious mind. I don’t have to know why something works, or how it works. I just have to know that it works. I use visualization all the time for me but it never occurred to me that Josh could use it. When I watch him work with Abby, I realize that he is putting visualization to work. I know, with absolute certainty, that he thinks about those workouts all week long. He plans things. I watch Abby work with him, and Josh does whatever she asks. 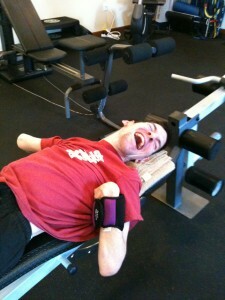 But, he holds back on some exercises, only to explode on the ones he’s waiting for. The ones he’s planned for. He knows, better than we do, how tiring each exercise is for him. He conserves, and waits for the moment he’s ‘visualized’ all week. Normally, I would have a photo posted here but I lost last week’s photos. Somehow between the download and the save, I ended up with an empty folder and the pictures erased off the camera. But the move Josh did was so surprising for me that I have to share. Josh waits all week to get put on the ball. For a couple of weeks he’s been able to raise his body up and put his left arm into what Abby and I call his ‘push up’ position. Last Thursday, when Abby got him positioned, he immediately pulled himself upwards into a solid kneeling position and before Abby or I could ask him what he was doing, Josh pulled his left arm into position, and immediately followed it with the right arm. I know he had to be ‘visualizing’ that move all week long. He did it like he’d practiced it a hundred times. The power of the mind. No amount of talking Josh through a move…no amount of showing him…or helping him….could give him the same sense of accomplishment that visualizing it in his own mind could give him. That is the missing key component. That is the one element that nobody can give him. He had to want it. I felt bad, when Josh first started working out, that I hadn’t thought of this sooner. That we hadn’t pursued more physical activity for him when he was younger. Where would he be now if we had done that? But, the missing component, was the personal ‘will’. Josh had to be ready for it. Had to want it. Had to visualize what he wants. I’m convinced this is working for him because he wants it to work. Going after a dream starts with a picture in your mind. You follow that dream with works. The key element to success is personal will. Nobody can give that to you. You feel it inside and it gives you a power to succeed that nothing else can. Highlights from Josh’s workout last week. For me, the exciting element to this photo is the bend in Josh’s hips. Four months ago, he couldn’t sit like this. He would have been straight from his chest to his knees and the sitting would have been non-existent. To get this angle of bend in his hips is going to allow him to stand up in a fairly normal manner and he’s back to being able to bear weight on his legs. This is a picture of success and it makes my heart sing to see it. 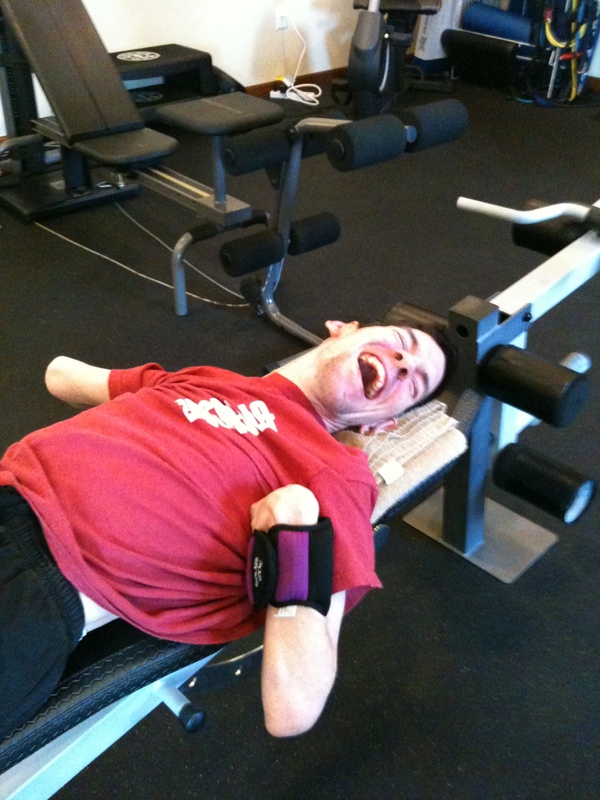 Josh is using the weight bench. You can tell by the look on his face that he’s super excited. The hand weights were too dangerous for him to use. His hands pop open at unexpected moments and we were afraid he’d drop one on his face. So, the 1 lb. wrist weights are on. 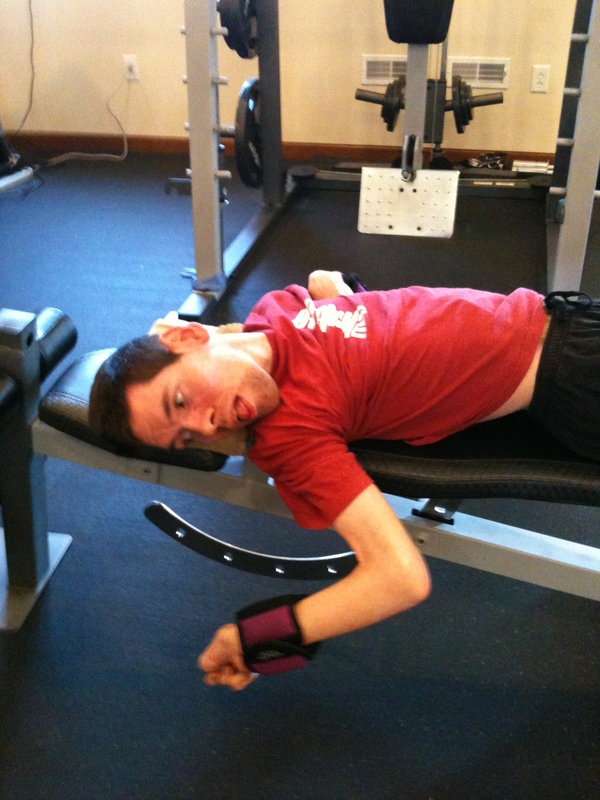 Being able to use the weight bench will allow Josh to build up his chest muscles. This was the one area we needed him to exercise and the weight bench work will be very helpful. Josh is looking for his hand. From infancy on, Josh seems to not know where his hands are unless he can visually see them. I’m hoping that every time he completes a move, his brain will remember how did it. Visualization at work. That’s the update for this week. It’s not the one I would have posted if I hadn’t lost the video footage but the message is clear. Visualize. Picture your goals in your head as often as you can. It will add strength and momentum to your actions. One of my favorite blogs. Very emotional for me. I’m always surprised when I write these blogs how they speak to my own mind. I think I needed the reminder that our own willpower is a key component to success. Way to go, Josh! You’ve advanced so much, just since I saw you in April! You have much to be proud of, in the physical training as well as in your paintings. You’re awesome! Thank you for stopping by. I hope Josh inspires others to shoot for the highest ideals they can ‘imagine’. He wore himself out today. He’s still getting used to working out twice a week. But there is no quit in him. When we ask him if he wants to cut back or stop, he just grins and shakes his head no. I’m so proud of him.